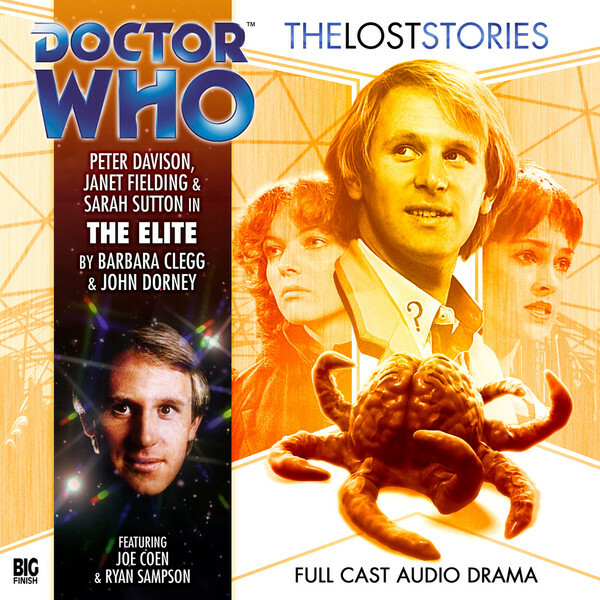 Following the incredibly successful introduction of Tom Baker’s Fourth Doctor to is audio family with The Fourth Doctor Box Set, Big Finish now welcomes Peter Davison’s Fifth Doctor into its The Lost Stories range with ‘The Elite,’ a tale from the mind of ‘Enlightenment’ scribe Barbara Clegg. Arriving in a domed city on a planet scarred by warfare where the young population fights for the glory of the Elite, the Doctor, Nyssa, and Tegan soon find themselves caught up in the machinations and changing schemes of The Cathedral of Power’s High Priest. Set after Tegan’s return to the TARDIS in ‘Arc of Infinity,’ ‘The Elite’ captures the essence of its era spectacularly, highlighting the city-based tale of rebellion against a familiar foe with a synthesized score. The dystopic setting with its intended goal of a achieving a master race under the guidance of its High Priest who descended from above is realized well, and even though the distorted voice and album cover should give the figure’s shrouded identity away, the audio medium keeps the surprise regarding the Dalek’s true presence hidden superbly to deliver maximum impact. It’s quite chilling to realize just how easily the general population takes to the violent Dalek philosophy, and the notion of the Dalek wanting to turn the population into Daleks when no true Daleks are around is an intriguing insight into this lone creature’s mindset. However, it’s the fact that the Dalek has achieved its goals too well, causing a rebellion against itself once revealing its true plans, that further elevates this story and helps it easily reach a satisfying conclusion. With no deus ex machina that saves lives or resets the situation, ‘The Elite’ is a powerful story bolstered by the finality of its violence, the Doctor and his companions emerging victorious amidst a field of the fallen. In a city that has undergone drastic change in the eleven years since its High Priest arrived and where now the less intelligent are disposed of and the purported war games are actually live footage, the characterization and performances successfully further enhance the violent undertones and overtones of the story. Once the Doctor almost begrudgingly accepts the fact that Tegan has returned, Peter Davison is able to bring his character’s indignant and sarcastic nature to the forefront, and his revulsion of the Dalek state of mind and its influence on the population is delivered perfectly. Sarah Sutton’s Nyssa is somewhat sidelined as she is brainwashed into joining the cause of extermination, but Janet Fielding’s Tegan is firmly front and centre, giving as good as she gets and proving to be quite adept at rebellious activities in her own right. Of course, a story with such a large cast and array of characters cannot survive solely by its leads, and though the rebels themselves are fairly generic, Ryan Sampson gives a truly sparkling performance as Thane descends into madness, and Nicholas Briggs’s take on this particular Dalek is unnervingly entertaining. Aside from the unfortunate sidelining of Nyssa- or perhaps because of it, as so happened during her tenure- ‘The Elite’ perfectly captures the spirit of early 1980s Doctor Who and proves to be another spectacular entry for The Lost Stories. A terrifying course of action for a lone Dalek to take provides a perfect foundation for a tale unafraid of the violence it entails, and strong direction and sound design keep the tense action flowing from beginning to end.